Usage rate is a great stat to correlate fantasy value, especially DFS. If you’re using possessions, that means shots are going up or you’re turning the ball over. Usually, the high-usage roles are left for the stars of the team, but you’ll see some occasional young guys get opportunities to impact their roster. Usually, the young, high-usage guards tend to be inefficient with all of that work. It has to do with tanking or just growing pains as they learn how to play against the best players on the planet. However, we've seen players improve on making shots and taking care of the ball as they get older. Here’s a list of young gunners under the age of 23 that had some noteworthy usage rates after the break. Devin Booker (32.7 usage rate post-break, age 21) - Not a surprise here that Booker leads the younger players. What’s more, he had a 108.8 pace when he was on the floor, and coach Igor Kokoskov said the Suns will be pushing it — just about all of the players have said this, too. 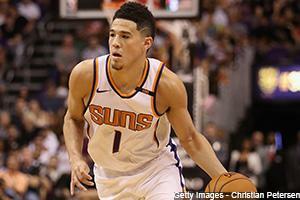 Considering how the Suns just maxed Booker and how they don’t really have a point guard they can count on in September, you would think Booker is set for a major opportunity to use possessions. It’s not crazy to think he leads the NBA in possessions per game and he pretty much has to go second round, especially if you can punt FG%. Donovan Mitchell (29.3, age 21) - Obviously Donny Mitch isn’t going to fly under any radars this year, and a rookie getting close to a 30 usage rate on one of the best teams during that span is beyond impressive. Mitchell did have some efficiency dips there at just 53.6 TS%, which explains why he was more of a mid-round finisher than when he was tearing it up in December or January. With a full offseason to learn the system and how to play with his teammates, Mitchell should have an even bigger opportunity. He’ll be going in the second round and it’s 100% justified. Dennis Smith Jr. (28.9, age 20) - Of the young high-volume guys, nobody was worse than DSJ from an efficiency standpoint at just 46.9 TS%. Over the season, he was just 16th percentile per possessions, so he really has nowhere to go but up. Ideally, you would draft him on a team that is punting FG%. Smith Jr. should get the volume again, though. Josh Jackson (28.8, age 21) - He played 10 games without Devin Booker, so that partially explains this. The Suns are currently a mess with their forward depth, especially with Ryan Anderson expected to start, per Woj. Jackson continues to fall in drafts and he could be a multiple-category filler. Although, he was a disaster in Vegas, so maybe the Suns won’t be relying on him on offense as much. Malik Monk (28.6, age 20) - He finished on a very high note late in the season with his 20.4 points per game over the last five — he was also efficient in that span at 63.9 TS% and a 31.9 usage rate. During the head-coaching search, GM Mitch Kupchak reportedly asked candidates how they can get more out of Malik Monk, and the team is now shifting Nicolas Batum to the three to open up guard minutes. He has nowhere to go but up after he ranked dead last in efficiency among the 511 players with 25 possessions last year, posting a putrid 0.439 points per possession. He’s a last-round dart throw or maybe a shade higher in points leagues. D’Angelo Russell (27.7, age 22) - DAR is having a head-turning offseason and the Nets dumping Jeremy Lin was a big win for his fantasy value, too. Of course, he turned the ball over way too much to get him to the high usage rate, but he wasn’t terrible on efficiency at 51.8 TS%. He should be on an up-tempo offense and the Nets should run enough three-guard lineups to keep him on the court. Coach Kenny Atkinson seems to really believe in him. Aaron Gordon (25.7, age 22) - The Magic dumping Elfrid Payton allowed several ball-handling responsibilities to go around. Gordon’s efficiency really trailed off as the year went on, so hopefully he can kick it into gear at age 23. Henry Ellenson (24.9, age 21) - The Pistons absolutely want him to get minutes, and they gave him the greenest light at Vegas. If Blake Griffin gets hurt, maybe we see some Ellenson action. Markelle Fultz (23.5, age 20) - He’s on the all-watch preseason team and we’ll see if Drew Hanlen can fix the former No. 1 pick.